Ventura, Ca. — The growth and popularity of big city marathons has led to record sell-outs around the world, opening the calendar to charming boutique events not looking to cram every last runner onto their narrow over-taxed roads – not that there is anything wrong with that. We found just such a gem this weekend glistening in the coastal California sun out the Ventura Highway north of Los Angeles, south of Santa Barbara. 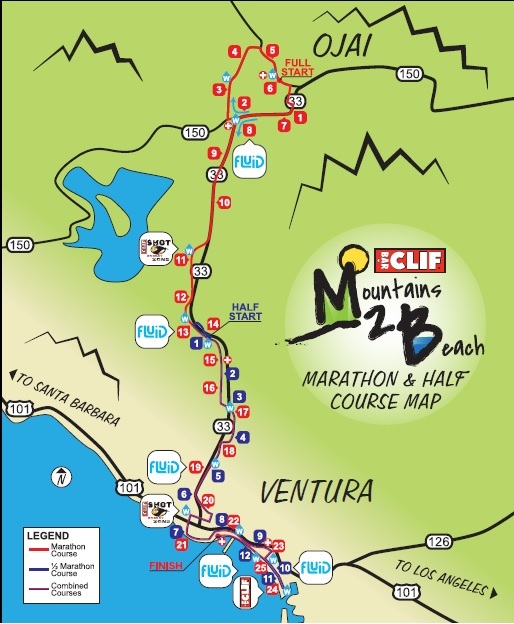 The 3rd Clif Bar Mountains 2 Beach Marathon & Half-Marathon gave its 3000 entrants — 1500 in each distance – a lovely journey from rural Ojai to seaside Ventura that had everyone raving about the course, the organization and thrilled with their new PRs. In spite of wearing a new pair of shoes — never a good idea in any race, much less a marathon — and planning to race again tomorrow in a 10K near Altadeena, the 41 year-old mechanic who works nine-hour days and has only been running six years, competed with the savvy of a veteran. His late race surge bested runner-up John Svet, 22, of Brea, California by just 35-seconds, while third-placer Matt Ebiner, 52, of Covina came home in a remarkable 2:32:55. The M2B Marathon course began near Nordoff High School in Ojai, before taking the runners on a serene 10k road loop followed by 10-plus miles of gentle downhill running along a split-rail fence lined bike path heading to Ventura. Once into town the course passed near the original Patagonia store, also known as the Great Pacific Iron Works, as it traversed a road and bike path that looped a little too close to the finish beside the Ventura Fairgrounds — don’t give ’em a chance to give in and drop out — then pushed the field on to the oceanfront for the final four miles along the water. 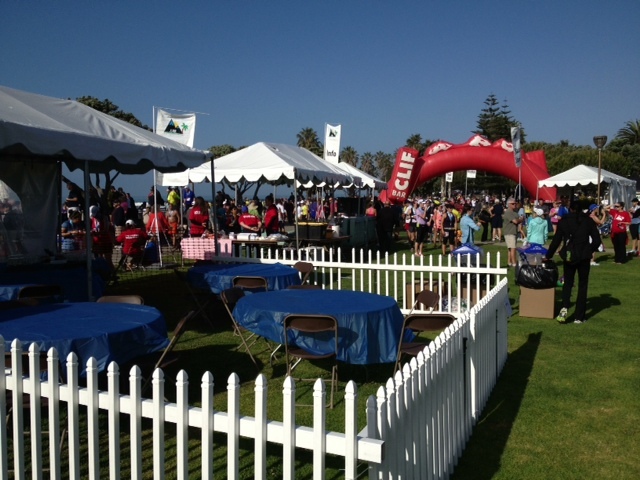 With its surfboard mile markers the course led the runners past beautiful mountain peaks, the Ventura River Basin, and the beach-front Pierpont neighborhood before finishing along the Ventura Promenade. With a net elevation drop of over 700 feet the M2B course made for an ideal Boston qualifier. 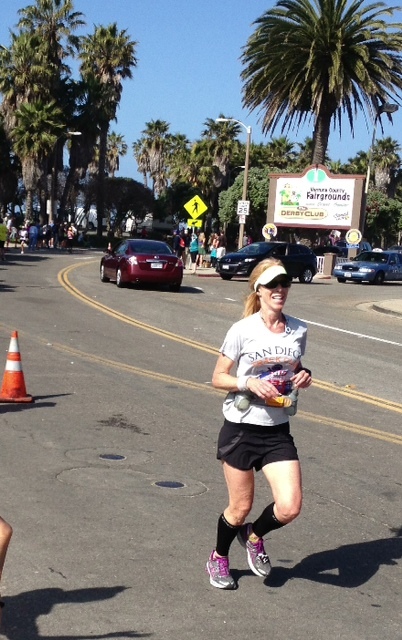 One such Boston Marathon seeker was Marla Scott Nelson, 47, a second-grade teacher at Murray Manor Elementary in La Mesa, California. 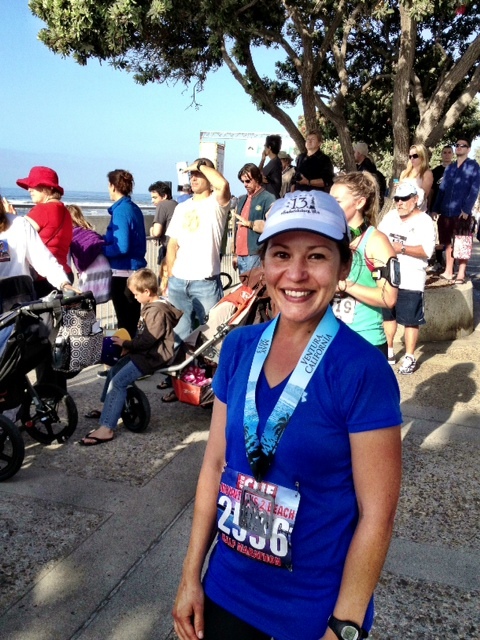 After signing on with (my wife) Toya Reavis’s training program last year – TReavis Fitness — Marla notched a 23-minute PR at the 2012 Rock `n` Roll Marathon in San Diego. From there Marla set her sights on Boston. 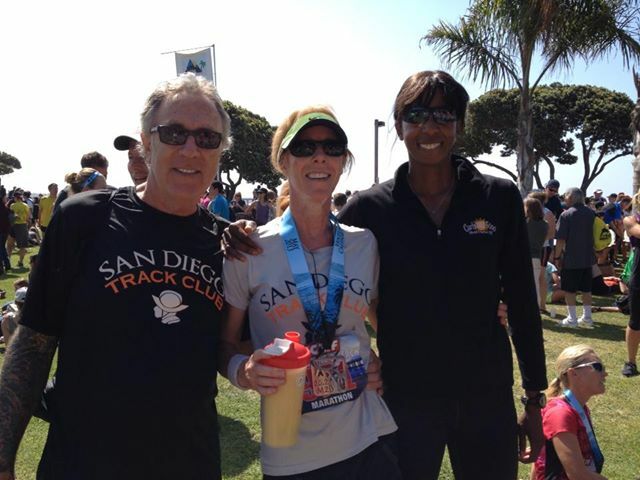 Planning to re-run Rock `n` Roll next week at home, Marla and about 30 other members of the San Diego Track Club balked after Competitor Group had to reconfigure the Rock `n` Roll course after the runners had already signed up. In the new design, what had been an early outbound section along Route 163 to Mission Valley was turned into a long, major hill at 21 miles. With eyes on a fast time, the SDTC runners opted for the transfer to Mountains 2 Beach. And the decision paid off as Marla posted another big PR, 3:45:39, well under the 3:55 qualifying time she needed for Boston 2014. Toya had her on a cautious 8:40 per mile average pace to begin, before a drop to 8:30s. Now in its third year, the event is the baby of marathon director Ben Dewitt and half-marathon director Josh Spiker. 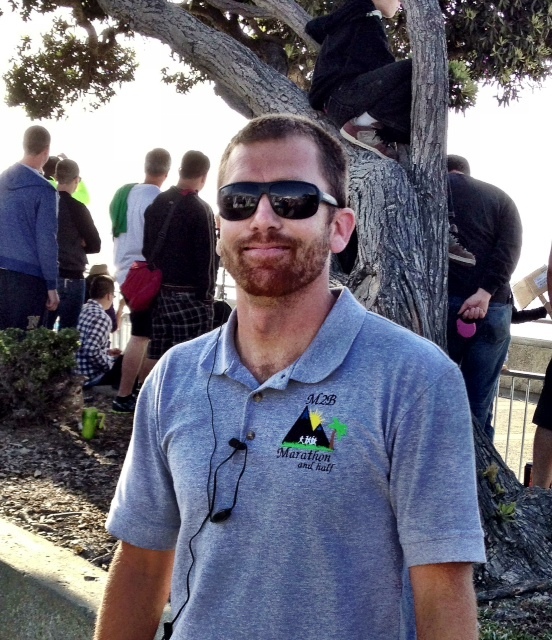 Ben has been a competitive runner, mountain biker and triathlete, as well as an event organizer. Josh is a graduate of Ventura High School (where the race expo was held), then a 4x All-American at the University of Wisconsin where he ran for then-Badger Coach Jerrry Schumacher alongside current top professionals Matt Tegenkamp and Chris Solinsky. And with prices starting at $60 for early marathon entry, M2B is a bargain at any speed, though it is a no frills event without road closures (not needed on the majority of the bike path course, anyway) and only self-checked bags. ”The only thing is the crowds are a little sparse,” remarked half-marathon runner-up Derek Delancey, 25, (1:12:39) who drove from Phoenix with his mom, wife Allison and their two kids, daughter Camryn, age 5, and son Brandon, 3. Allison is a former 800 meter All-American out of Weber State who had hoped to use M2B as a tune up for the USATF Half-Marathon Championship in Duluth, Minnesota in June. But she came down with an injury and couldn’t run. 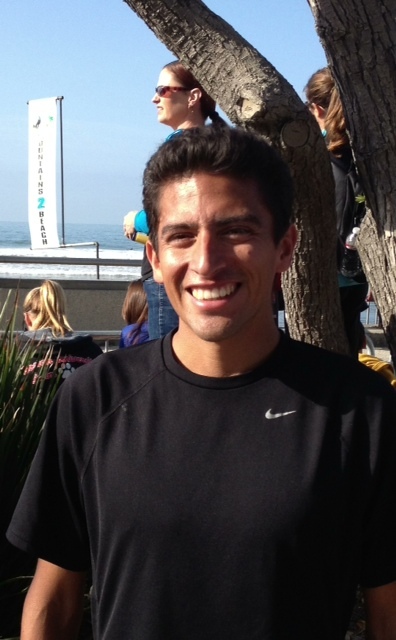 Ramiro “Curly” Guillen III, 31, out of Santa Barbara ran a two-minute PR of 1:09:25 to earn the half-marathon victory. A graduate of U.C. 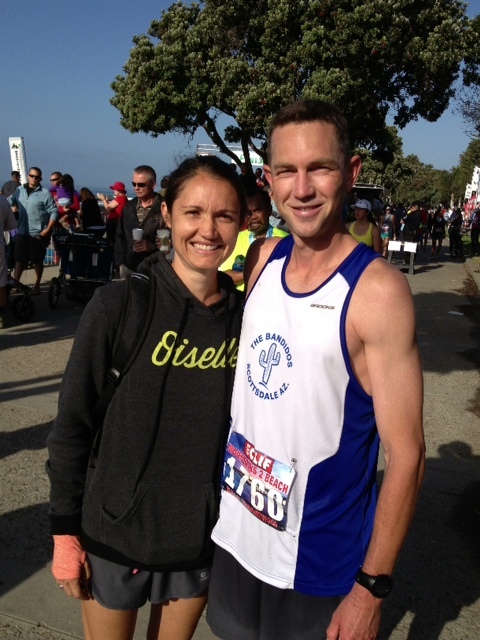 Santa Barbara, Curly ran Boston this year in 2:35, a five-minute marathon PR. He, too, is married with two children, Noah, age 5, and daughter Mackenzie, age 2 ½. 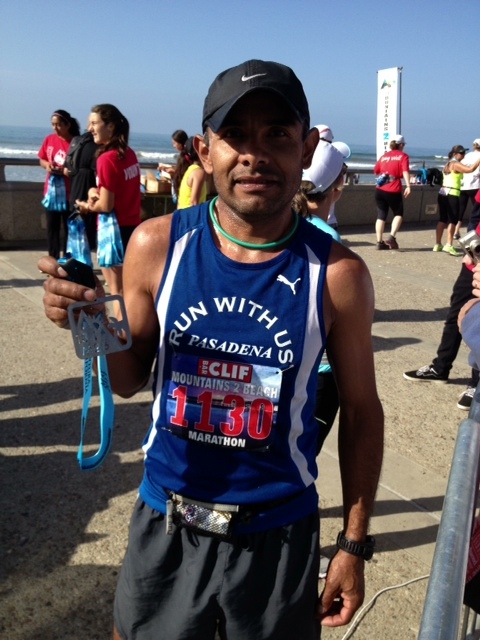 A typical sub-elite runner, Guillen has both a government job by day, and is a club DJ three nights a week. “I average five hours of sleep a day,” he laughed, even as he trains 80-100 miles per week. With his growing family and two jobs Curly had quit running several years ago until his wife encouraged him to get back into it. 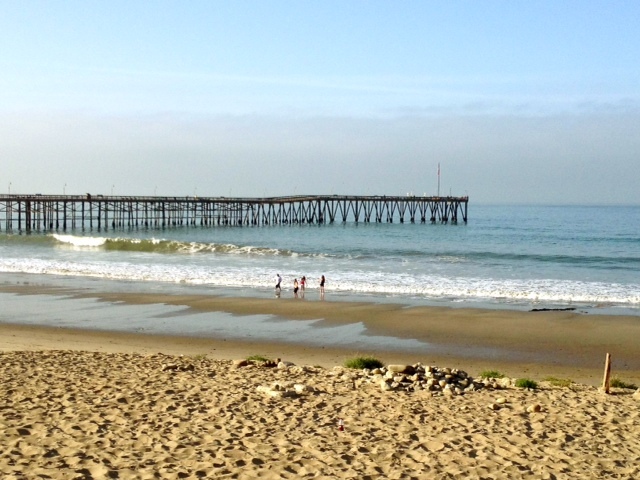 While children played in the sand and surfers rode the waves alongside the Ventura Pier, the downtown shopkeepers and restauranteurs prepared for the holiday traffic as the runners continued to ride the waves of support along the Promenade. With a 6 a.m. start temperature of around 50°F, a scenic, fast course over which to run — and an out-and-back 5k along the Promenade for the less adventurous — followed by a seaside party and arts fair in the warming California sun, one wonders how long the bib numbers will last in 2014 as this gem of an event tries to maintain its boutique flavor as word spreads of its many charms. Finally qualified for the Trials! 2:17:36 at CIM yesterday in Sacramento. I’ve come a long way! Haha! Saw the results, Curly. Good for you. Many congratulations! Sounds like an addition to my “maybe someday” list. How were the temps? 50 at start, maybe mid-60s by finish, then 70 in afternoon. Perfect.